Get ready to bust out your happy dance. Some of you have been waiting a long time for this and we’re excited to finally let you know: QuickBooks On-Premise is here. 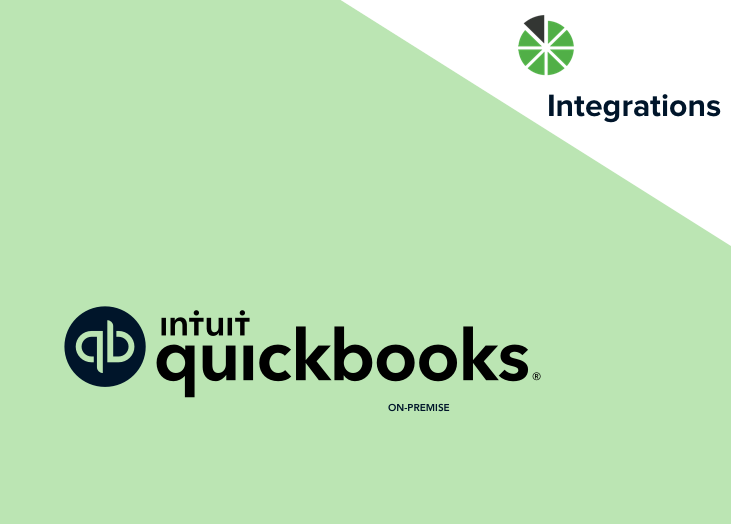 When you integrate BrightGauge and QuickBooks On-Premise, you’ll have access to crucial financial data, right at your fingertips. You’ll know where you stand financially while focusing more time on revenue-generating tasks. QuickBooks On-Premise is now available for you to connect with and start pulling data from. It takes just a few steps to get started with QuickBooks On-Premise. After you add QuickBooks On-Premise from your datasources list in BrightGauge, you'll need to configure the settings. It should take about 5-10 minutes total to connect to this datasource. Step-by-step instructions can be found in our onboarding document. We always want you to start viewing your data as soon as you connect to a new datasource, because every moment counts. There are certain KPIs that matter to mostly everyone and based on those KPIs, we pre-build gauges, dashboards, and reports for every datasource, made available to you as soon as you connect. With QuickBooks On-Premise, you’ll have access to 35 pre-built gauges, 4 default dashboards, and 4 reports. If you’re looking for a complicated custom build-out or have any questions about custom fields, our Support Team is on hand to help you out. As you’d expect, all QuickBooks On-Premise default gauges take a close look at your financial metrics. Gauges include Accounts Payable Aging Summary, Accounts Receivable Aging Summary, Cash Balance, EBITDA Performance by Month, Outstanding Invoices, Profit & Loss Performance, Revenue by Category, and more. 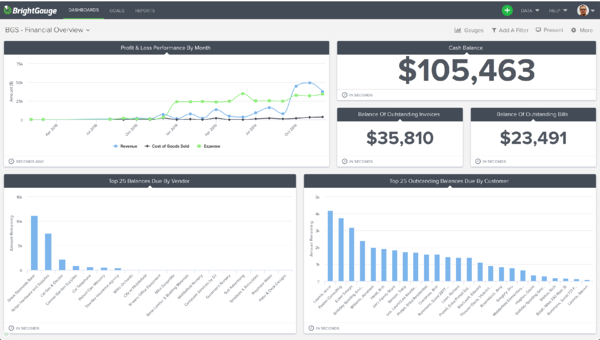 Four dashboards help you categorize your gauges into separate buckets right off the bat: COGS Detail, Expenses Detail, Financial Overview, and Revenue Detail. Money is a sensitive topic, so it’s something stakeholders are going to want to know about on a frequent basis. 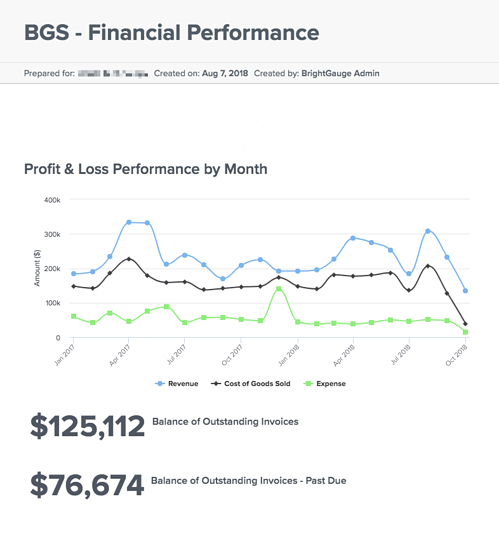 It’s really simple to create custom, impactful client reports in just a few minutes in BrightGauge, but we help you get started with 4 templates: Financial Overview, Monthly Expense Report, Quarterly P&L Review, and Weekly Account Review . By the way, even though these are templates, you are still free to customize them to your liking. We’re big, huge fans of setting and tracking goals and if you have yet to use this feature, you might consider giving it a shot. Having a goal that’s tied to finances is a powerful way to keep your team motivated and accountable. Some ideas are: Nothing Over 90 Days Past Due; X Amount Cash in Bank; X Invoices Delivered, etc. Get creative and remember to keep it fun. Goals should be challenging, but they shouldn’t be the sole determiner of salary bumps and promotions. Are you ready to see what BrightGauge can do with your QuickBooks On-Premise data? Contact us today to get started.